Penn Shell Heishi 2-3 mm heishi Beads. What you see here is the natural color of the shells and none of them were dyed. 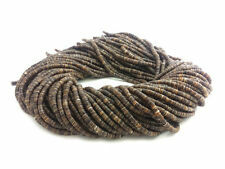 Grade A Baby Olive Heishi Shell 1 strands 2 -3 mm heishi Beads. Bead, mother-of-pearl (dyed), dark gold, stick, 8x7mm - 15x7mm, Mohs hardness 3-1/2. SILVER VILLAGE. Send it back. No explanations necessary! Money Back GUARANTY! Trending at $7.68eBay determines this price through a machine learned model of the product's sale prices within the last 90 days. 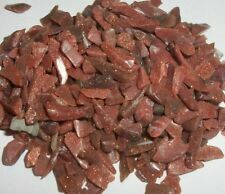 MP1358 Brown 19mm Flat Rectangle Mother of Pearl Gemstone Shell Beads 15"
Mother of Pearl. Type: Natural Shell, Dyed Color. Form: Temporarily Strung Beads. Colors may look differently on individual monitor due to the color setting and lighting etc. of beads: approx. Don't worry. MP281spf Brown 15mm Flat Diamond Square Mother of Pearl Gemstone Shell Beads 16"
MP993 Natural Brown Small 4mm -7mm Tri-Tip Nugget Mother of Pearl Shell Bead 15"
MP1434 Cocoa Brown 17mm Diamond Mother of Pearl Gemstone Shell Beads 15"
Carved Cowrie Shell Focal Gemstone Shell Beads. Shell: Tiger Spotted Cowrie Shell. Focal exhibit natural curve of cowrie shell. Shape: Carved oval with palm tree design. Since shells are a natural material, color and size will vary. CRL147 Brown Bamboo Coral Small 6mm Tapered Oval Rice Beads 16"
Bamboo coral is a type of coral and can found in the waters off the coast of. Bamboo Coral Gemstone Beads. The skeleton can be polished, dyed and used in coral jewelry. Stone: Bamboo Coral. Shape: Tapered Oval Rice. 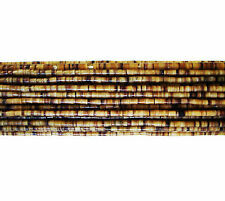 MP1574 Golden Brown 30mm Flat Round Mother of Pearl Gemstone Shell Beads 16"
Beautiful Round Chinese Mussel Shells. 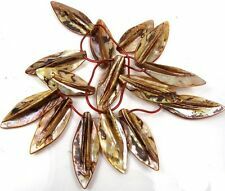 Material: Chinese Mussel Shell. Shape: Link and Drop Mixture. Flat Rectangle, Flat Flower& Flat Triangle w 3 holes. Use: Economical & lightweight, these beautiful shells easily dangle from earrings & necklaces for fabulous jewelry pieces. MP1453 Cocoa Brown 15mm Flat Round Mother of Pearl Gemstone Shell Beads 15"
MP1916 Cocoa Brown 12mm Flat Puffed Round Mother of Pearl Shell Beads 15"
MP614 Light Brown 18mm Flat Round Coin Mother of Pearl Shell Gemstone Bead 15"
MP2024 Golden Brown 10mm Flat Puffed Round Coin Mother of Pearl Shell Beads 16"
MP1825 Brown Small 5mm - 9mm Tri-Tip Nugget Mother of Pearl Shell Beads 16"
MP1819 Brown 22mm Flat Hexagon Mother of Pearl Gemstone Shell Beads 15"
Beautiful Round Chinese Mussel Shells. Material: Chinese Mussel Shell. Use: Economical & lightweight, these beautiful shells easily dangle from earrings & necklaces for fabulous jewelry pieces. Shell Beads. 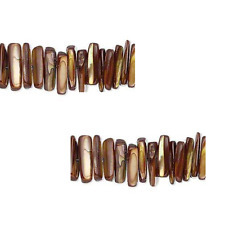 MP1777 Brown Flat Square Diamond 20mm Mother of Pearl Gemstone Shell Beads 15"
This is a curly tail beads made out of Luhuanus sea shell, this is also known as "Green Everlasting". This is one of a kind and perfect for jewelry making. This piece of art is hand made in the beautiful island of the Philippines. MP2348 Brown 17mm Diamond Marquise Mother of Pearl Gemstone Shell Beads 15"
MP314 Cocoa Brown Blush 14mm Flower Mother of Pearl Gemstone Shell Beads 16"
MP632 Cocoa Brown 12mm Round Coin Mother of Pearl Shell Gemstone Bead 15"
MP1969 Golden Brown 20mm Flat Triangle Mother of Pearl Gemstone Shell Beads 15"
MP1645 Light Brown Medium 7mm - 9mm Mother Of Pearl Gemstone Chip Shell Bead 35"
Shape: Carved, Single-Sided Oval Flower Focal. Natural Bone Gemstone Focal Pendant. Color: Tan, Light Brown.Plus crafts and finished jewelry. Be Dazzlin Beads. Imported from. Treasure Hunters Emporium. MP1655 Light Brown 15mm - 16mm Flat Flower Mother of Pearl Shell Beads 15"
Jewelry Making Craft 7mm Round Gemstone Mop Brown Shell Beads Strand 15"
Black Brown Pen Heishi Chips Shell Beads 5mm 8mm 8"
Lot of 3 Real Ocean Coral White Shell Necklaces 17"